My friend, Jennifer, over at Ink N' Scrap Habits does weekly sketch challenges. 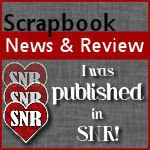 This is a card I made for Sketch 6 which you can see here. It seems I needed a little kick-start to get creating again and these were just the ticket. Thanks, Jennifer. 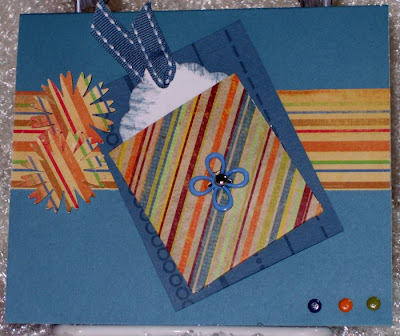 For this card I used a gorgeous blue from CTMH, but I don't know the specific colour, sorry. 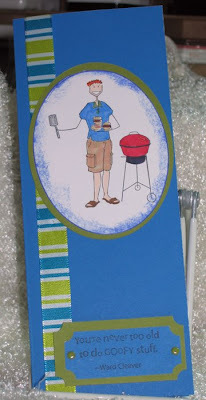 I stamped Grillafella on Select White by PTI and coloured him with Copic Ciao markers. I used my CM oval to cut both the image and then a larger oval in Old Olive. I had the perfect ribbon so I cut off a piece and attached it to the card. The sentiment is from the Smarty Pants set by SU. Added a couple of brads and there you go. Easy-peasy! To the right, is the card I did for Sketch 7. The little tag inside the pocket says "Birthday Wishes" from the Sincere Salutations set by SU. The base of this card is Blue Bayou, the patterned paper was a tiny bit of scrap, so unknown, and the punched flowers were made using the Martha Stewart punch. I added some Blue Bayou ribbon and a few brads to finish it off. Also an easy card to make. I picked up my SU order from Donna this weekend and just had to play with my "stuff". I am so in love with the Inspired by Nature set and I can see a few Christmas gifts will be made with this set. It's great for home decor items. 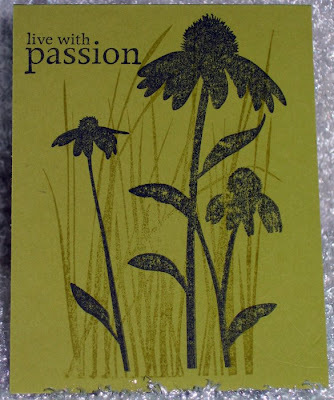 I used the new Kiwi Kiss and stamped the grass using the same colour ink. The flowers, of course, are stamped in Palette Hybrid Black ink. Next time I'll make sure the stamp is well-inked to make a clearer impression. That's it for today. Hopefully, I'll be back again tomorrow with more creations. Thanks for stopping by. My craft room is sort of ready! 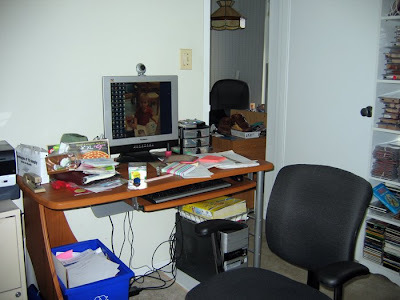 If you look at the pic of my desk, to the right is a door that leads into the kitchen and you can see a bit of DH's desk and chair. When we're both on our computers, we can see and chat with each other very easily. To the left my computer desk stands the printer which is on top of a file cabinet. 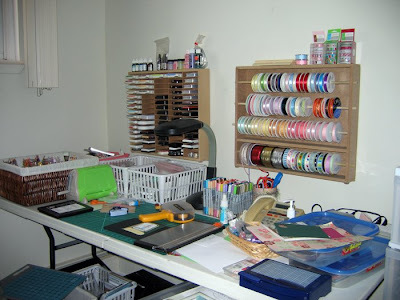 Next to the printer is a craft table that holds the overflow of stuff that I use but don't need all the time. It has things like my Postal scale, Bind-It-All, extra flowers and pens, etc. It's handy if I need them. djarvis10@rogers.com (sorry, I don't know how to make it link for you). Dave will be happy to give you a price and he will ship anywhere in North America. 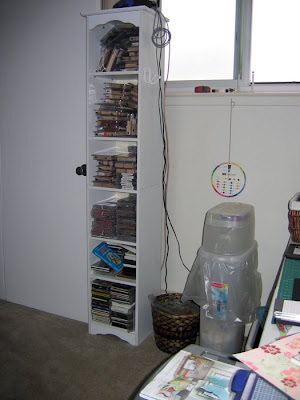 To the left of my craft table stands the big, tall storage unit. It is home to all of my stamp sets. Right now the bottom two shelves have some of John's CDs and books, but they're getting sent to a new home soon and will be replaced by my clear stamps sets, of which I have thousands and thousands (not really, but is sounds good). This last picture is of the closet. It is home to four Iris carts which contain craft stuff I absolutely need. I couldn't tell you what is in them at the moment, but I know I needed whatever is in the drawers. 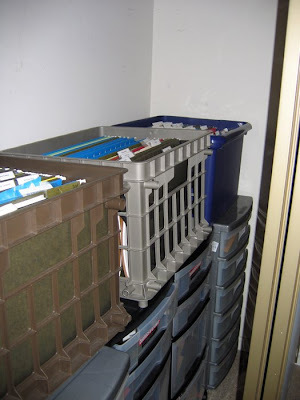 On top of the carts are plastic storage bins which hold all my 8-1/2" x 11" cardstock, all nicely labelled and sorted by colour families, ie: pinks, reds, oranges.....etc. In front of each colour is a file for scraps in that colour. It works well for me. I can tell this will be a never-ending project of re-organizing, re-arranging and constant growth, but it's so much fun having an entire room dedicated to my craft. I love it! For the past two years, The Stamp Shack has commissioned an artist to draw a "Stamp Shack Santa". This year, based on a poll over at The Shack, the majority of members wanted a snowman. This wonderful image was created for us by Paul Gunson and what a beautiful stamp this will be. There will be only one run of this stamp and you can pre-order it until Friday, August 29, 2008. Hurry over and place your order now so that you will have it in plenty of time for creating delightful Christmas cards and, be the owner of a limited edition stamp. You can place your pre-orders here. 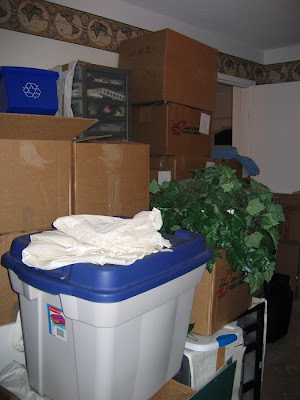 Tomorrow the moving company will be back to pick up 25 clear plastic bags, normally used for leaves, that are just jam-packed with paper and about 100 boxes. 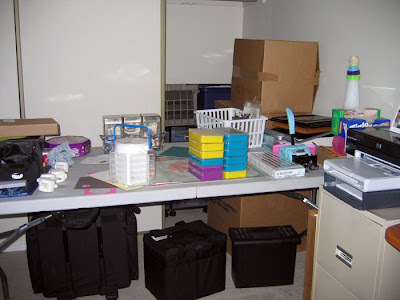 As soon as they are gone, we'll have room to move around and unpack the remaining boxes, which I estimate to be about 20 or so, many of them holding my crafting supplies. I'll soon be back in the swing of things, just in time for Halloween and Christmas! On a sadder note, the reason I've been MIA is because my ex-husband passed away suddenly on August 9th. Our children have been devastated, to say the least, and I've wanted to be there to help them and care for them any way I can. My ex and I remained friends and I will miss him. Whenever I came to Guelph to see the kids, I always looked forward to at least sharing an hour or two over a glass of Dubonnet for me and a Rusty Nail for him, and just talking about our kids and remembering the good times and sharing our hopes for each of their futures. Discussing the grandchildren was always a highlight of our conversations. I'll miss Peter and those talks, but I believe he will be watching over his children from his seat in Heaven. Starting Friday August 15th through Sunday September 28st JessicaLynnOriginal is hosting our own version of the Olympic Games to earn Gift Certificates. Why is it running so long, so people can order stamps and have enough time to get them via the mail. The Gift Certificates can be used for anything in our store and they are also transferable. So if you wanted to give any or all of it away as a gift that can be done for no cost. There will be other prizes such as: coupons, free stamps, custom stamps, and more! * Email Address for contact purposes. * Each point achievement has its own set of requirements. * All requests for points must be qualified. like to win the gift certificates are eligible to be part of this contest. We will have an Olympic page that you want watch the "status" on the points. We will update the points totals as often as we can. Add my name to help you earn GOLD! 1 point * for each person you refer to sign up for the JessicaLynnOriginal mailing list. The email address must be an active email to qualify. Requirement:Include your first & last name (please add Barb Kaszuba if I am the one referring you) in the Referral Code box. Requirement: To earn the point you must include "stamp from JessicaLynnOriginal" in your details about the card. Requirement: You must email us with the link to view that the card was posted in any of those locations. Each Order from JessicaLynnOriginal's online store will earn you three points. Requirement: If you have a friend order on your behalf that is just fine. They would need to include your first & last name in the comments when they submit the order. Requirement: Your orders count as well. If you are member of the JessicaLynnOriginal Stamp club. If you register during early registration you earn a point too! * Only new registrations, new cards, new orders will qualify for the points. Previous orders are appreciated but do not qualify. We are in our condo at last, but not without a problem or two. First, the truck was due to arrive around 8:30 a.m. on Saturday, July 26th. He arrived at 10 a.m., but could not get the 76 ft. tractor-trailer down the apartment driveway. This meant that the move-in was post-poned until Sunday, but before that could happen there had to be an emergency meeting of the Board of Directors for the Condo Corp. because moving in is not allowed on Sundays. They kindly made an exception after I begged them to let us in. So, the truck driver arranges for a smaller truck (read an extra $1,000) and he parks across the street in a huge mall parking lot and transfers furniture and boxes from the tractor-trailer to the smaller truck. Drives the small truck over to the loading/unloading dock where about 4 guys are waiting to unload and bring it up in the smallest elevator for freight I've ever seen, and the move-in begins. 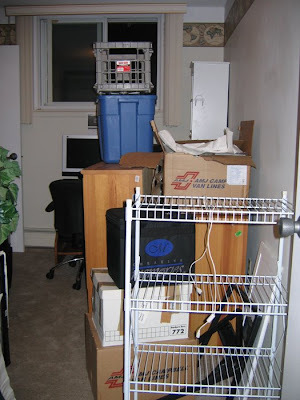 This happens about 10 times, shuttling the furniture from one truck to the smaller truck to the apartment. We started at 9:00 a.m. and didn't finish until 5:30 p.m. What a way to say hello to your new neighbours by breaking one of the most stringent rules. I will have to make a card of thanks/appreciation for the Board and post one in the mail room, too. So, here I sit amongst 278 boxes and bits of furniture! I know that's the exact number because we had to mark them off on a list as items came through the door to make sure nothing was missed. I can't even see my craft room yet and may not for a couple of weeks. I'm actually using John's computer because mine won't be hooked up until my craft room can be accessed. It contains boxes at the moment. Mathematically speaking, 2500 sq. ft. of household goods do not fit easily into 1350 sq. ft. of apartment. The phone doesn't work. It seems that the line coming into the apartment is still the previous owner. Maybe I should make all my long distance calls now, before the repairman arrives tomorrow morning to re-direct it to our new number! The fridge didn't work after the move, so there goes another $300 to have the electric starter components replaced. It's working now so I'm happy. I can't find the coffee and even if I did, I don't know where the can opener is because nothing is unpacked in the kitchen. Thank goodness we love to eat out. Sears haven't called me back to arrange a time for the installation of the washer and dryer, but my new stove is being delivered today. Yeah, but no food to cook. Another yeah! So, here I sit in my new home and my sons have been fabulously helpful. I've seen them everyday and am loving it. I love my new place and don't plan on moving any time soon. Being around Jackson, my grandson is amazing. I still can't believe I'll be able to see him on a regular basis and watch him growing up. Here's a couple of pictures of my 'future' craft room. Any guesses how long it will take to get organized. We have already received some terrific "Welcome to your New Home" cards from friends. Sherri, thanks so much and both John and I would love for you to visit; Cathy, thanks for your card and I hope you find your new home really soon and that we can get together for stamping times and to my 'sis', Jennifer, your card is darling and we're really not that far away anymore and I do hope to meet up with you before Christmas. Thanks, ladies, your thoughtfulness means a great deal to me.